First of all. How about those gold lips? Shimmery! 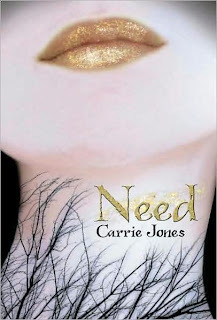 The color of those lips does a good job of representing the glittery-but-dangerous magic in this book. Just as the pale skin of their owner conveys the tone of the story quite well: pale, cold, and creepy. I'm pretty sure this is my first pixie urban fantasy and I wasn't sure what to expect. What I did not expect was feeling like I was back inside the world of Stephen King's It. But apparently if a book's got Maine, winter, and a town with a curse on it, it will always evoke the same prickly, back-of-the-neck feelings in me. And Need's heroine shares my sentiments. Zara's stepdad is dead. After watching her waste away day by day, Zara's mother puts her on a plane and sends her to her de facto grandmother--her stepdad's mom Betty. Betty lives in Maine. Maine feels like another world to Zara. A world in which the every surface is blanketed in snow and the local teenagers are all track stars or football talent or some other sort of gifted. These things combined make Zara real nervous. As a coping mechanism, she recites phobias in the hopes that naming her fear will help her face it. Yeah, she's brave and likeable that way. And she makes a trio of truly cool, hilarious friends. The adorably scattered Issie, the kind and quiet Devyn, and the dark and looming Nick. The three of them begin giving Zara a reason to get up again. There are, of course, some kids who don't like the new girl. And there is, of course, a bit of a love triangle (but not really). And it's all very high school. That is until gold dust starts showing up everywhere and her classmates start turning out to be Not Who She Thought They Were. And it becomes clear that something wicked is definitely this way coming. Need is a good one to stay up late at night reading. Alone. That way you can take full advantage of the awful not-pretty pixies going to eat you factor. And, really, when was the last time you did that? What I liked about Ms. Jones' writing is the way she created a truly scary world and villain with very little overt description. I have no idea what he looks like. In my head he's this huge dark form without a face and he is the scarier for it. Part of this is accounted for by the fog Zara is in when she first arrives in Maine, and part by the fear that seems to grow no matter how many names she gives it. I liked that she had such good friends and that they were actually a part of the story, not just background music. Once I met Issie and Devyn, I wanted more and more of them. Nick is definitely a good guy and could probably have used a little more conflict for my taste. But I liked him well enough. His hero complex was indeed charming. Thanks go to Chelle's review for pushing me to get this one. I would be happy to read more in this world. Recommended for fans of Holly Black. Ooh, thanks Kimberly! Love the new banner on your blog, btw. I decided to make a name, since I'm always leaving anon comments. I'm glad you liked this book. I bought it, but then heard nothing but bad reviews from people, started it a few times, couldn't get into it, then put it down. But you seem to have liked it, and we always agree (except for that unfortunate Rumors incident) and I love Holly Black, so I'll give it another whirl. Hey, Same. :) Yeah, if you've got a few hours and are in the mood, it makes for a pleasant night's read. I really did fall for her friends and the bleak atmosphere she had goin on. If you do finish it let me know what you thought. Well, I'm glad you sorta-mostly liked it. :) I enjoyed Zara's friends quite a bit, too, and Devyn's got to get more time in the sequel. Plus, I liked the Maine setting. I'm a New Englander myself and could totally relate to the wintery atmosphere. Devyn is still waters run deep awesome. I loved the setting as well. So definitely a sequel in the works?